The Portable Milling Machine supplied by us in the market is remarkable for its world class quality and performance. The Vertical Milling Machines designed by us are made of highly durable materials and are very proficient in their functional area. Apart from this, we are counted among the chief Portable Milling Unit Manufacturer in India. This machine is developed for insitu drilling, milling and other operations on surfaces of large fabricated bases, welded structure. The machine is designed to be fixed near the fabrication next to the surface to be machined. They carryout the machining on the required surfaces with milling cutter using carbide inserts. Machine is suitable for face milling, drilling, reaming, boring etc. Facilities to align and level the machines with the job are provided. Different stroke lengths offered depending upon the customer requirements. Various capacities milling heads option is available depending upon the material to be removed. 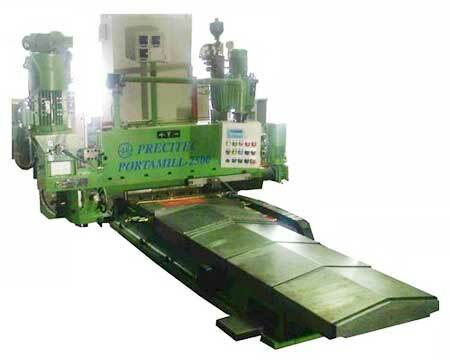 The basic configuration of the machine is that of a vertical moving head type milling machine. The slides and milling head used are from the standard ranges of spindle units and the slide units developed by Precitec.